Please note, I am currently not trading due to a broken back. I have worked with him many times and he's both skilled and conscientious. 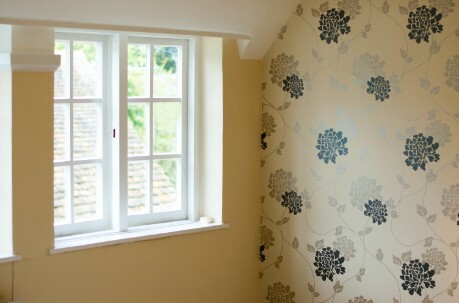 I am an experienced, professional painter and decorator based in Stratford-upon-Avon. Location: I usually work in South Warwickshire, East Worcestershire and North Gloucestershire - but can travel for suitable projects. Insured: My business is fully insured, up to £2m public liability insurance. Click 'policy details below' for confirmation. Materials: Everyone has their own individual taste, so the choice of colours, paints and papers are of course yours - but I am always happy to advise on colours, finishes and the best materials for your property. I specialise in traditional finishes using the best materials available, fillers like Toupret, resin repairs from Repair Care, paints from Little Greene, Farrow and Ball, Mylands, Tikkurila, Mythic, Dulux and more. Paint types: I keep a good stock of colour cards and fans for: Dulux, Crown, Tikkurila, Little Greene, Paint Library, Farrow and Ball, Earthborn, Mylands Colours of London, Sandtex, Johnstones, Leyland, Mythic, Sanderson, Bedec, Marston & Langinger, Craig & Rose, Laura Ashley, NCS Colours, Colortrend, Holkham Linseed Paints, Glidden and Albany. I can obtain other colour cards on request. For a free quote, please get in touch by using the form on the Contact Page. This manor house bedroom was last papered a hundred years ago - I can be sure as I found a page of the Daily Mail behind the lining paper dated October 1911! After a lot of preparation, the walls were painted with Farrow and Ball paints, the woodwork with Dulux Trade Satinwood, and the striking wallpaper was supplied by Laura Ashley. Top photo: Ornate metal railings, painted with Hammerite. Stratford upon Avon, Alcester, Bidford, Wellesbourne, Warwick, Leamington Spa, Henley in Arden, Ettington, Tiddington, Snitterfield and beyond.